Powerful sysadmin/enterprise tool (was Casper Suite). Is there a better alternative to Jamf Pro? Is Jamf Pro really the best app in Network category? Will Jamf Pro work good on macOS 10.13.4? 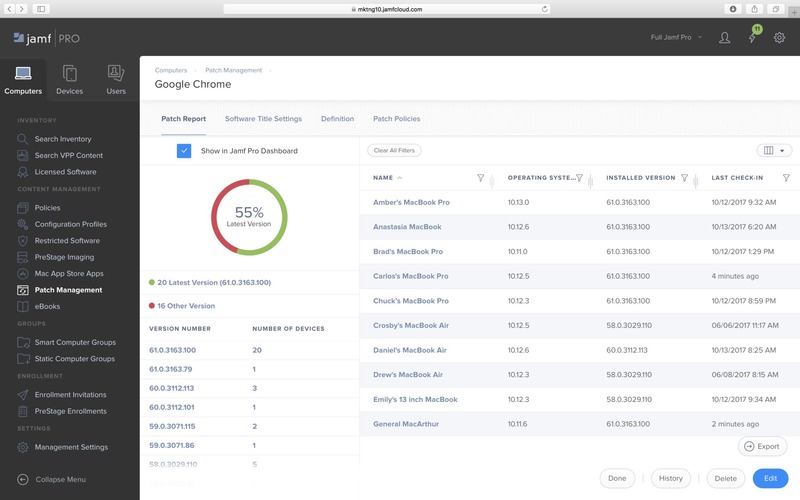 Jamf Pro (formerly Casper Suite) is the EMM tool that delights IT pros and the users they support by delivering on the promise of unified endpoint management for Apple devices. At Jamf, connecting the Apple user experience with IT requirements has been our business for the last decade. 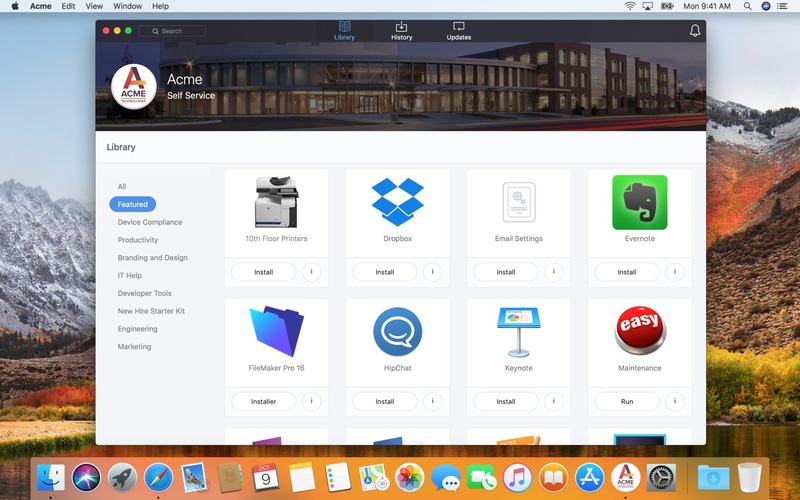 With Jamf Pro for Mac, iPad, iPhone, and Apple TV management, IT can support an extraordinary Apple experience for the end user while meeting or exceeding organization goals and requirements. Collapsible sidebar menu gives you more screen space to work with when you need it. Breadcrumbs shows you the path you’ve taken and provides a quick link back. Whether you work at a school, business, or government agency, Jamf Pro has been developed to meet your needs--because it's supported by Apple specialists for the enterprise. Because we understand the potential of Apple in the enterprise, and how to help you get where you want to be. To begin your journey, take the first step: learn how Jamf Pro can transform Apple ecosystem management in your organization. Then engage with Jamf to help every step of the way. Note: Pricing for Jamf Pro is license-based, with discounts for volume purchases and education organizations. Please contact Jamf for more information. Contextual warnings will help you solve common issues quickly and direct you where to go. 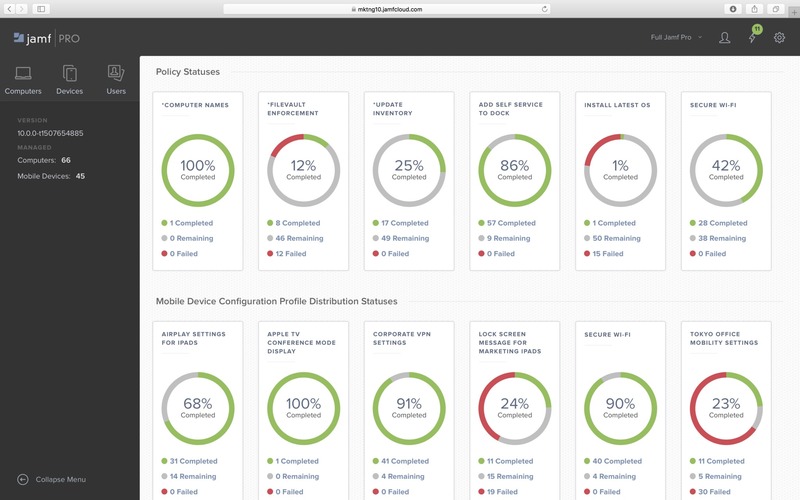 Access Jamf Pro 10 on your mobile devices and perform common management actions. Patch notifications keeps you informed to when patches are available from common software titles. Patch reports shows you exactly what software versions are running on all your Macs. The brand new Patch policies, purpose-built for patching, will automatically scope your eligible devices and give you control over how the patch is delivered. Simple navigation in the library allows users to find what they need quickly. The new History tab shows users what they have previously downloaded or patched. Patch notifications and updates are consolidated into one location and will let the user know when it’s time to update their software. Make Self Service your own by fully customizing the branding, including the banner, icon and app name itself.